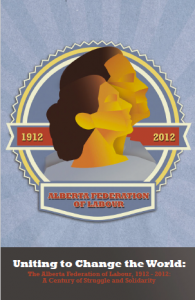 Uniting to Change the World The Alberta Federation of Labour, 1912 – 2012: A Century of Struggle and Solidarity (Download PDF) was written by Jim Selby with Winston Gereluk. It tells the remarkably complicated story of the many struggles, formations, divisions and mergers through which the Alberta Federation of Labour (AFL) went to emerge in the form it is today. It describes how the AFL was initiated when District 18 of the United Mineworkers of America resolved to launch a new provincial federation of labour to unite working men and women across the province. To do that, it invited locals from across Alberta to make common cause with the farmers who made up the majority of the Alberta’s population to a founding convention of the Alberta Federation of Labour in Lethbridge on July 14 and 15, 1912. 34 delegates came from Edmonton, Calgary, Medicine Hat and Lethbridge Trades and Labor Councils and other unions. In spite of the many challenges, downturns and disappointments, the Alberta Federation of Labour has kept alive the vision of a unified labour movement striving for a province in which workers could live and work in dignity. It has focused attention on the broader ideals and principles, so that unions could become more than a means to protect the narrow interests of specific groups of workers, and instead work for the betterment of the working class.